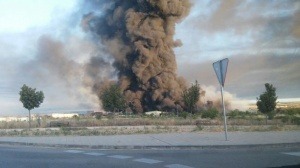 Firefighters have been struggling since Friday to bring under control a fire which broke out at a recycling plant in the municipality of Chiloeches (province of Guadalajara, Castilla-La Mancha), raising concerns over air quality after it emerged that the plant had been closed down for safety reasons by the regional government. It is reported that over 20.000 tons of potentially dangerous materials have been at the mercy of the flames in Chiloeches, where earlier this year the government of Castilla-La Mancha withdrew authorization for recycling activity due to the sheer volume of material which was being treated there. At the same time the Town Hall discovered that safety regulations were not being complied with, and issued its own closure order in June. In the video we can see how the materials inside the plant are causing explosions. The blaze resulted in an impressive pall of black smoke rising into the sky over Chiloeches, but the regional government didn’t consider any risk for those living in the town and none were evacuated from their homes. This latest incident comes in the wake of the fire at an illegal tyre dump in Seseña in May and raises further questions over the way on which waste materials are managed, recycled and disposed of in many parts of Spain.